Looking forward to partner yoga. Mrs. Rairden will have those poses ready for us. I made this visual so that everyone knows what the expected behaviors are during partner yoga. I have a wonderful first grade “girl group”. It seems that all problems are BIG problems in their world but we will be working to change that! 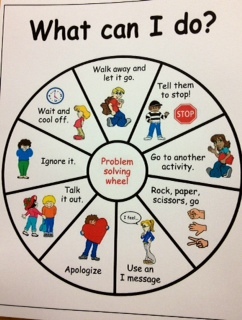 I love this Problem Solving Wheel. I gave each teacher a copy to post as a visual support for social problem solving. I want to support the girls in solving their own problems with expected behaviors. I got the Wheel from http://therapyandlearningservices.com. It was posted by Funtastic Early Childhood Ideas. Both are great sites. Mrs. Rairden and I had a great planning session today. 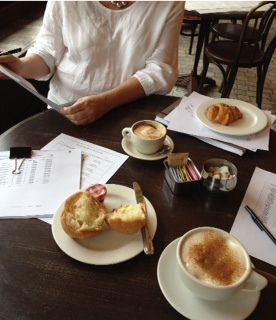 I think we were so productive because we were in a lovely patisserie having coffee and pastries. 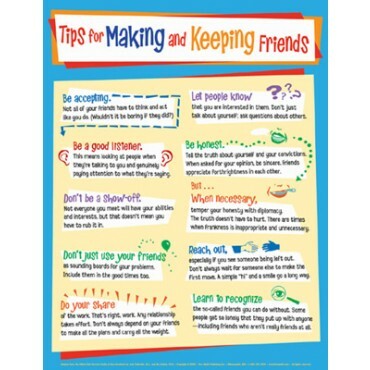 When we form the social skills groups, we consider grade, personality and level of social thinking ability. We like to bring students together who compliment the group. Classroom teachers help us select students to join the group as “friends” or “models”. This year we want to train student volunteers to act as peer mentors. Our long range plan is that the students who are currently in the groups will become the future mentors of younger students. 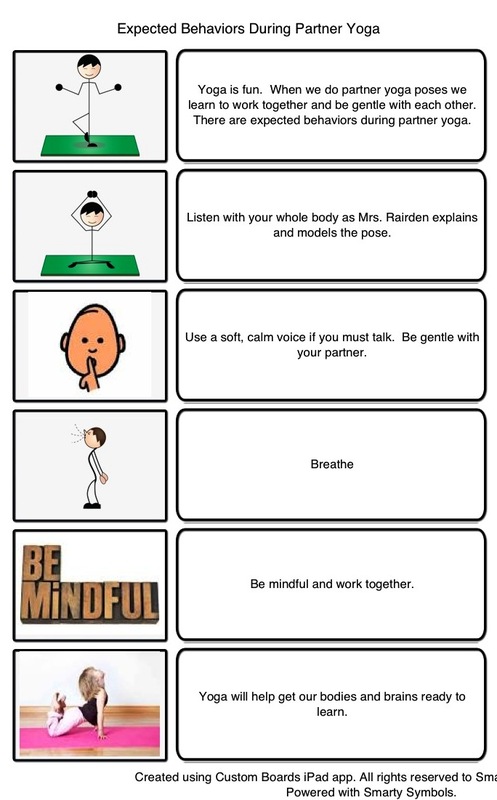 that students can use as a reminder of what strategies they can use to self-regulate. We are so looking forward to Tuesday when we will meet with our first group of the new school year! I have been a “busy bee” today! 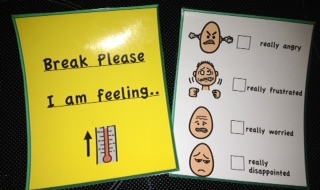 I have printed and laminated some visual supports to give to the classroom teachers who will be teaching my students this fall. Here’s one that I love, love, love! 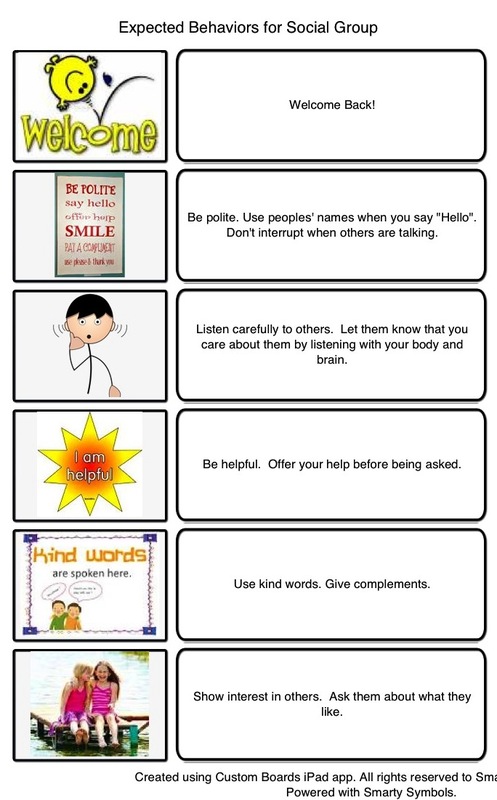 Found it on Pinterest and you can visit http://rockandteach.blogspot.com for the freebie. Spoken language usually serves to increase rather than decrease stress levels. Visuals help to create less stressful and smoother routine communication. Rather than engage in a verbal exchange with a student the teacher can just hand this visual to the student or place it on the student’s desk. I think this will be a better way of getting their attention than using words. Sometimes I think what they hear is “Blah, Blah, Blah”. When a student needs to be released from an activity he/she will make that need known one way or another. If he/she does not have an expected and easy way to request out of the activity, we may see unexpected behavior serving as that communication. 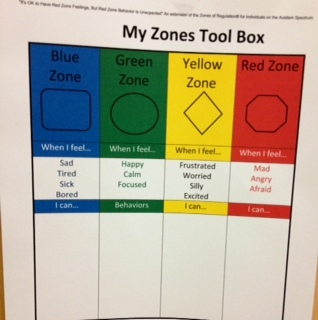 I love empowering students to self-check and monitor their own feelings and behaviors. This visual is perfect for just that. PS Autastic Avenues is very close to getting 100 Likes on the Facebook page. Go over and Like! I am so very pleased to announce that my colleague, Tracy Scott, and I have formed our new business. 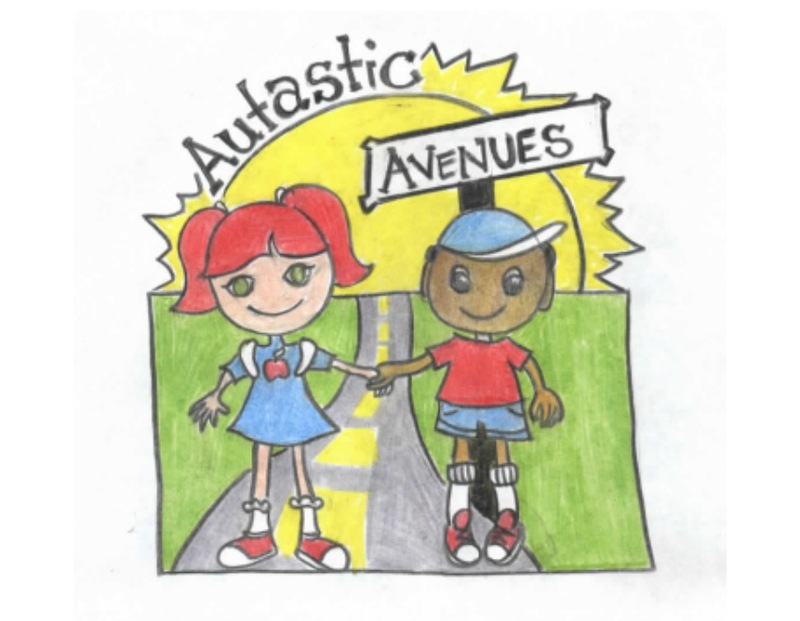 Autastic Avenues! We finalized the LLC today, so it is official. We are still in the formative stages but we do have a Facebook page! Like us and follow our adventures . The plan is to offer the following services: social skills groups (preK, early elementary, upper elementary, middle and high school), executive functions homework coaching, parent support group, tutoring and speech therapy (for starters!). Contact us at autasticavenues@gmail.com for more information. We hope to start our first groups in October. Looking forward to getting the Lunch Buddies groups back together again! The plan is to have a focus on friendships. Lunch Buddies provides a fun and safe environment to practice the essential skills for making and keeping friends. 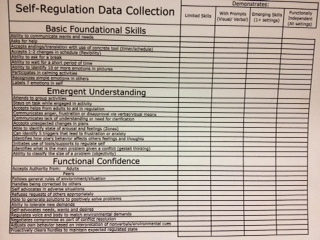 For most of our students these important skills must be explicitly taught and practiced. The way we make and keep friends in kindergarten is different than how we do it in 3rd grade, so we have new resources, games and materials. With our Mentor Club, we hope to use peer mentors to facilitate generalization of skills in the natural environment. Check back often to follow the development of the Mentor Club and how we are doing with making and keeping friends. 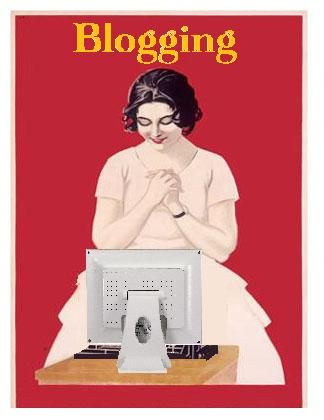 It has been one year since I thought about starting a blog. I was clueless about getting started but lucky for me there is a youtube video for everything! The original purpose for LunchBuddiesPlus was to communicate with busy parents about what goes on in our social skills groups. As I became more confident and comfortable I wanted to communicate with other school-based SLP’s and share what worked successfully in the groups. I think that I achieved my goals with some great bonuses. 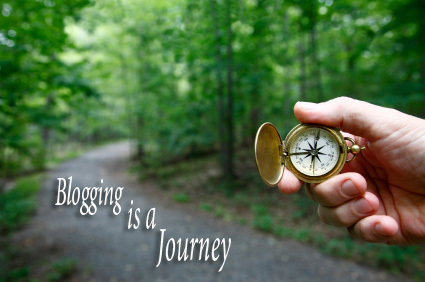 I have connected with many great folks through this blog and learned a great deal. I should have plenty to write about and there will be plenty of visual supports. The new school year begins in a couple of weeks so visit often as the journey continues. 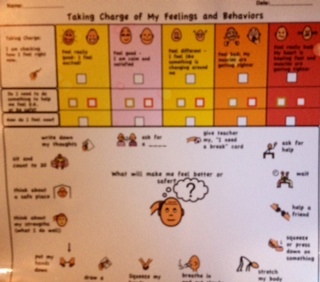 I have guest posted about how and why we use visual supports in our social skills groups over at http://praacticalaac.org. Very excited to have had this opportunity to share! Lately, I have been mindful of how much think time and wait time that I need in my day to day interactions with others. I get really annoyed when others interrupt my thinking process by repeating the question that was just asked or fill in my pauses with their own words. I’m thinking “how often do I do that to my students?”. I just read that in most classrooms, students are typically given less than one second to respond to a question posed by a teacher. Whoa! 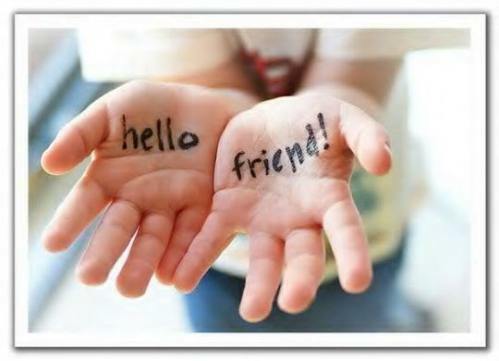 I have also noticed that when I greet some of my students during the school day and they do not respond within a second, the adults with them start prompting “Say hi” and keep saying “Say hi” without pausing. Again, Whoa! As a speech pathologist, I know the importance of wait time. I know that if I want to connect with a student I need to give them enough wait time to process what I have asked or said. Waiting expectantly lets the student know that I am interested in what he/she has to say. Dena Lee writes in Ten Keys to Becoming a Better Communication Partner, “Repeating the directions or giving the child help without waiting, takes away their communication opportunity”. Please read the lovely series posted on http://thelittlestories.com/blog/. 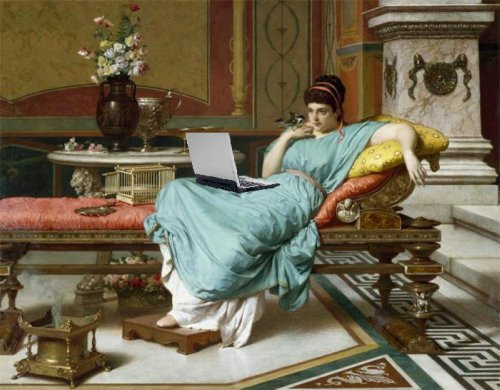 The author Kim Rowe writes about the Perfect Pause. I work in a preschool as well as an elementary school and I plan to share 10 Ways to Practice Waiting with parents and teachers. 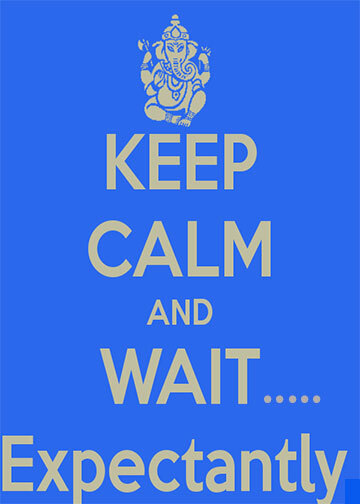 Waiting and giving think time and wait time is soooooo hard but so very important to our students. We have to think about it on purpose and remind ourselves how to be a good communication partner. This year I plan to have visual reminders all around me to help me to be mindful of the need for think time and wait time. 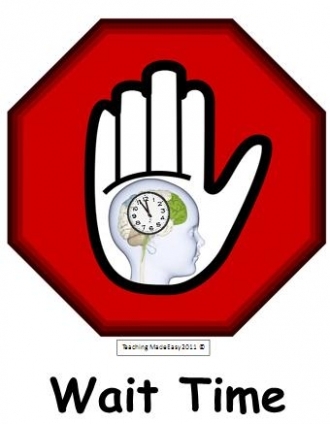 This visual prompt from http://www.TeachingMadeEasy.com will remind me to stop, wait, think. I love this visual from http://praacticalaac.org. 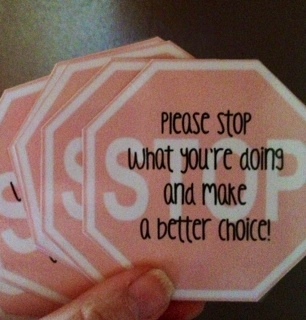 I am going to post these all around the school and hand them out to all the support staff. Most of the time my summer reading consists of what I call “beach reads” or “trashy novels” but during these last weeks of the break I decided to read something educational. 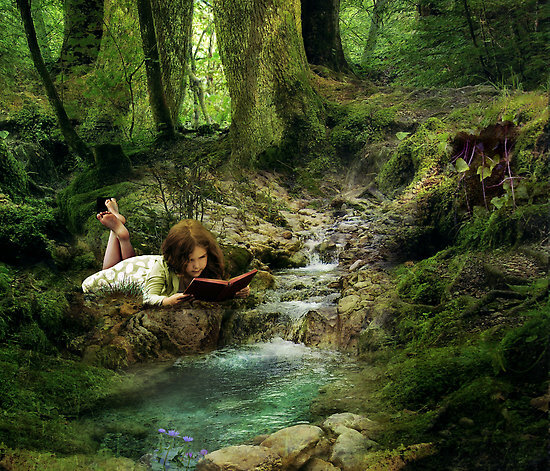 As I research and investigate for my blog posts, I make a list of the resources and books that catch my eye. This one screamed “Read Me, Read Me”. The above comment sealed the deal, so I bought the book and have been reading and rereading ever since. 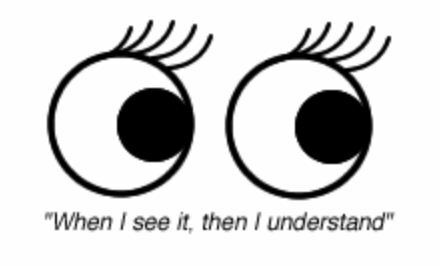 My interest was piqued as I read the list of Essential Concepts for Understanding Behavior and my eyes popped out on “the only behavior teachers can control is their own”. 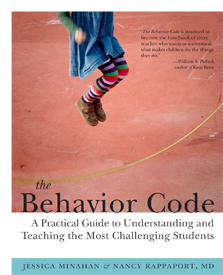 Authors Jessica Minahan and Nancy Rappaport, MD write that “one of the most powerful ways to help teachers is to show them how changing their own behavior can help guide students toward behavior change”. The authors offer a FAIR Plan. FAIR is an acronym: F is for understanding the function of the behavior, A is for accommodations, I is for intervention strategies, and R is for responses. 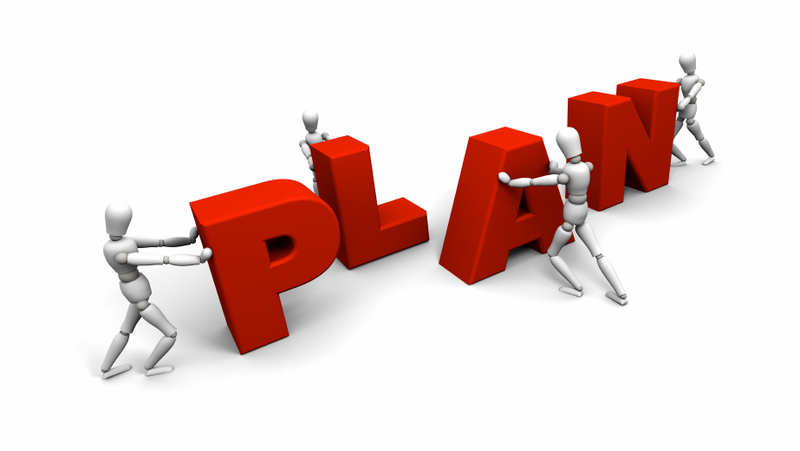 They believe that good plans help teachers interact with challenging students in a more productive and preemptive way. They believe in replacement behaviors and coping strategies. Me too. As I said before, I am reading, rereading and making notes. I highly recommend this book for parents, teachers and administrators. 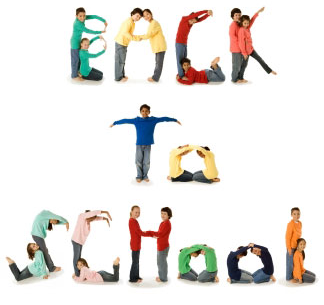 A typical activity for the first day back at school is to share events of your summer vacation. Even teachers/therapists “get” to do it as an ice breaker during staff development. Bec Oakley writes in her blog post, The Really Big List of Back to School Tips for kids with ASD, “one of the hands-down absolute worst kill-me-now aspects of the first day back at school was having to sum up what I did over the summer break” (http://www.snagglebox.com). I totally agree with that! Being put on the spot can erase even the most fun memory of summer in a matter of seconds and then all that comes out is “nothing” or “I don’t know”. Helping your child by reviewing some of the highlights of the summer using pictures or making a list will increase their comfort level. 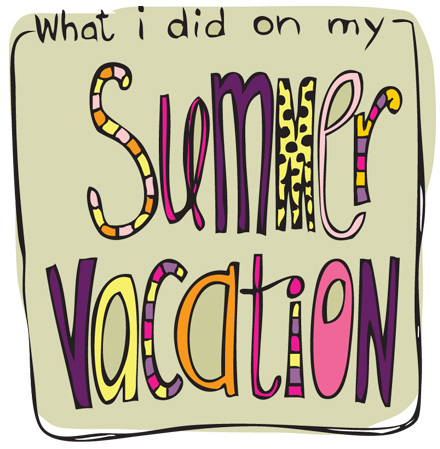 Practice how to answer that question “What did you do on your summer vacation?” both orally and in writing ( it is bound to happen that your child will be asked in conversation or to write it down). Use a photo and write on the back two or three words or phrases to prompt your child to describe a really fun day during the summer. 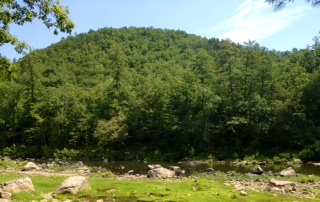 I went to the Goshen Pass, Goshen, Va. I waded in the water and it was very cold. Sometimes kids just don’t think that they did anything exciting. Sometimes they just don’t like sharing. We can help them by preparing and practicing.